TAPS’ were quietly performed by a military band and could be heard all over the Kigali Convention and Exhibition Village (KCEV) in Rwanda’s capital Kigali on Monday, April 8. 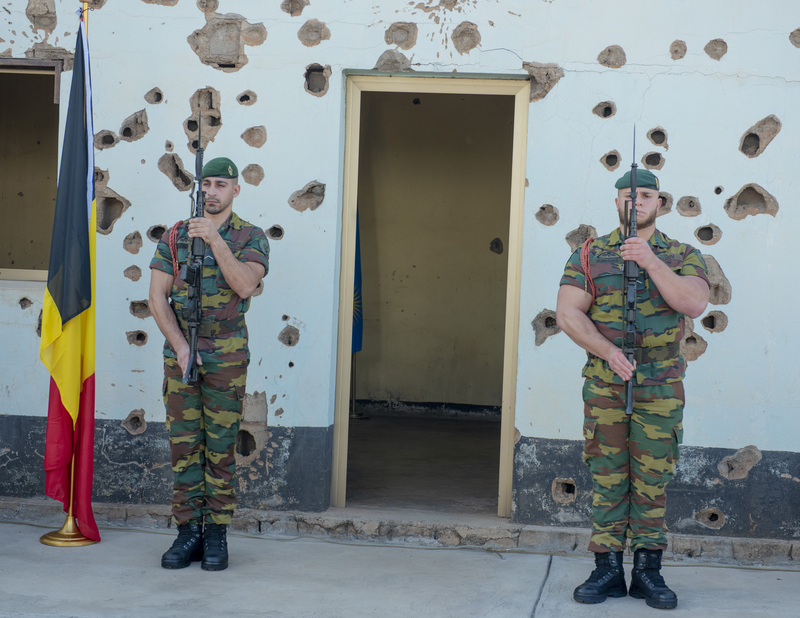 Not for a Rwanda Defence Force (RDF) ceremony – but to join Belgium government to salute 10 Belgian commandos killed in the 1994 Genocide against the Tutsi. 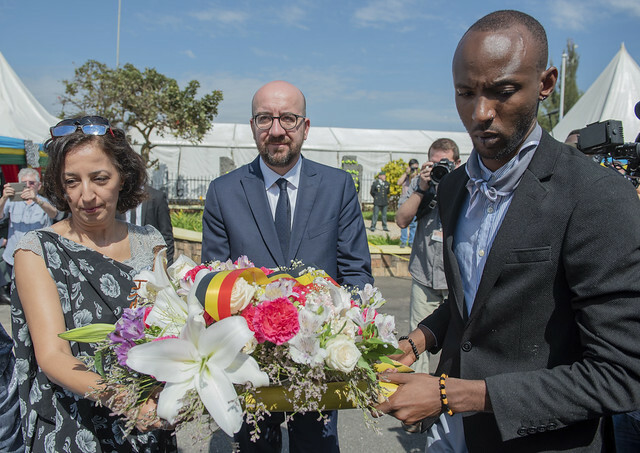 Prime Minister of Belgium Charles Michel led a big delegation to Rwanda to pay tribute to them. Monday morning was the same – 25 years back. 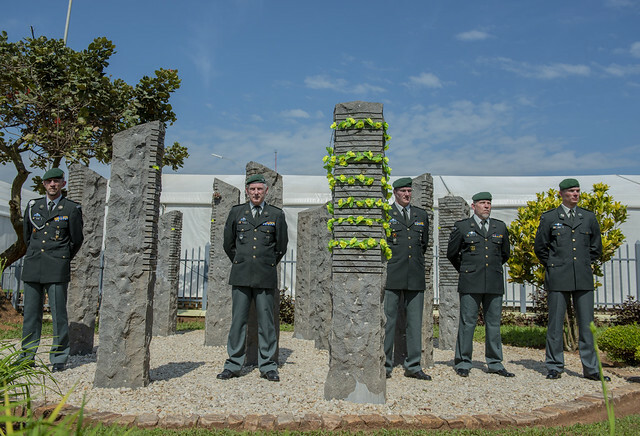 They wanted no talk of what they have done – or the courage of their youth; but to reflect on how Belgian commandos were murdered in line of duty. “May their souls and memories live forever into every one of us, to make the future of humanity more precious and more delightful,” Prime Minister Michel said in a somber speech. Relatives and friends of the fallen commandos, Rwandan officials led by Prime Minister Dr. Edourd Ngirente listened quietly, as sharp-looking Belgian commandos surrounded Prime Minister Michel. 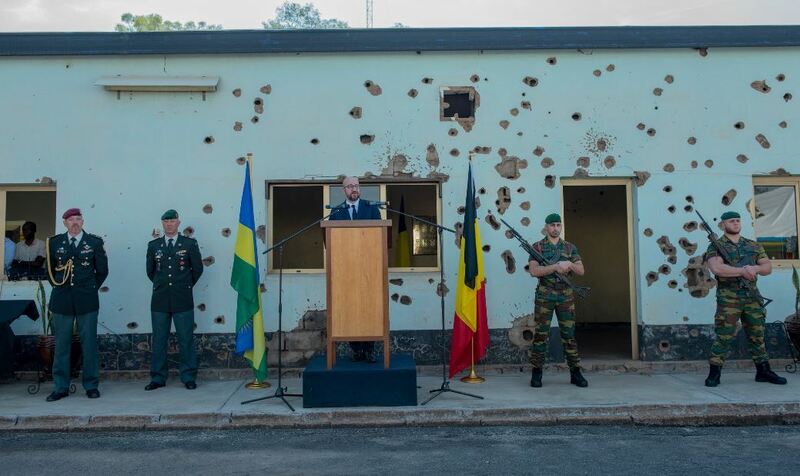 “In the name of the Belgian people, I bow before the great memories of the ten soldiers of the second battalion of Flawinne as well as to the Genocide victims, may their souls rest in peace,” added Prime Minister Charles Michel. Flawinne is a village, belonging to the Belgian city of Namur located in the province of Namur in Wallonia. The commandos had been sent to Rwanda on a humanitarian mission. But they died before realizing their dream. The Belgian U.N. soldiers were killed a day after the Rwandan president’s plane was shot down on April 6, 1994, the genocide followed this plane crash and claimed over 1 million lives. They had arrived in Rwanda a year before under the Mission des Nations Unies Pour l’Assistance au Rwanda (MINUAR). On the fateful day the commandos were murdered, they had been fighting to protect former Prime Minister Agathe Uwilingiyimana, but their effort was overpowered. After hours of fighting, they were murdered by the Presidential guard squad. Bullet marks are still vivid on the wall of a building where the commandos fought before their last breathe – reflecting the scene of a brutal massacre conducted by former Presidential guards. Passing a message of courage past the agony these events 25 years back, Rwanda’s Prime Minister Dr. Edourd Ngirente had his touch. Prime Minister Ngirente’s message has a root. 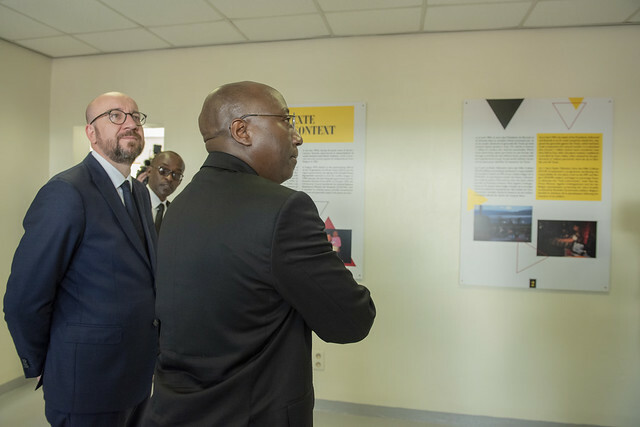 During his speech, Prime Minister Charles Michel revealed that his country’s Parliament will, before end of April this year, pass a law on genocide denial and revisionism. If passed, the law could come as a relief to millions of citizens of both countries including families of the 10 Belgian commandos killed.